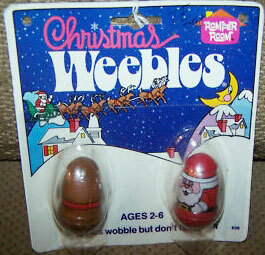 Description: The Christmas Weebles set is one of the two Romper Room Holiday Weeble sets. The set includes a Santa and a Rudolph Weeble. HTW342 - Santa - Red base, red top santa figure with red jacket, black belt, and a teddy bear (holding a candycane) tucked in the back. HTW343 - Rudolph the Red Nose Reindeer - Brown base, brown top reindeer with a red collar. Collar has 3 yellow bells on the front.